The Catholic bride is insistent about getting married a church. The Jewish groom will agree but wants to bring his religious traditions to the wedding. Having a ketubah ceremony at the hotel where the Bride and Groom are getting ready. It should be right after everyone is dressed and ready to go to the Church, as this works best for timing and coordination and the solemnity of the occasion. After the ceremony at the Church, it will be time for photos and fun! The ketubah signing is a time to emphasize bringing two people and two families together, and some of the ideas below can be part of that. 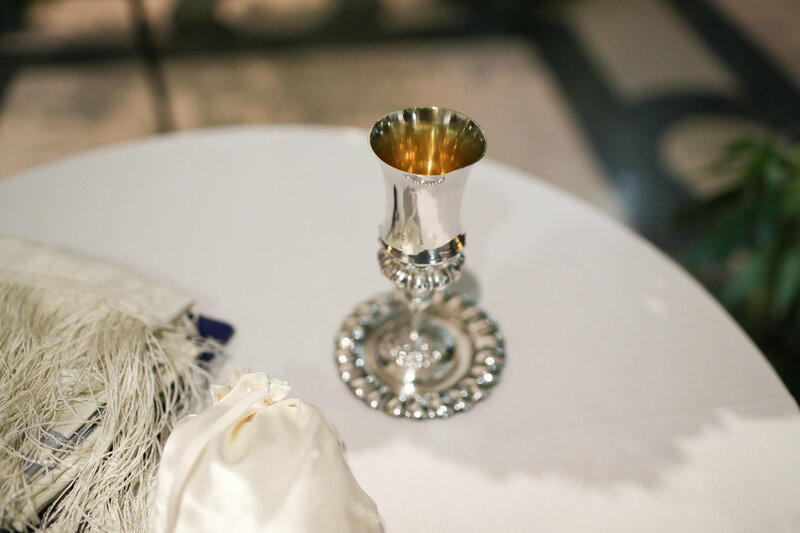 Kiddush (at the ketubah signing)… The Bride and Groom can share a cup of wine, and then the Bride can offer wine to the Groom’s parents, and the Groom can offer wine to the Bride’s. There can be a chuppah. One idea is for the couple and their parents to stand under it while the Bride and Groom sign the ketubah. Another idea is to have it near the doorway so everyone who is invited to attend the ketubah signing walks through the symbolic home of the bride and groom. Jewish tradition says when a couple finds one another, it brings an abundance of blessings into their lives and also into the lives of those around them and into the world. These seven blessings represent the completion of the creation of the individuals entering the marriage. Other ways to acknowledge those who have passed away: leaving empty seats at the ketubah signing. The Bride (and Groom) can place a single flower on each seat as they enter. Nothing has to be said, if that is what is chosen, but it is a lovely and symbolic and clear gesture that these individuals are very much present in the room. Another option is to have a vase on the ketubah table with just the number of flowers of the people you want to specifically remember at this time. Nothing needs to be said if that is chosen, but the meaning is clear. In the room with the ketubah signing, you might want to display photographs of family members… perhaps wedding photos or others. As this is a gathering of two families, the photos of each can be interspersed with the other. Then all were ready to go to the Church!